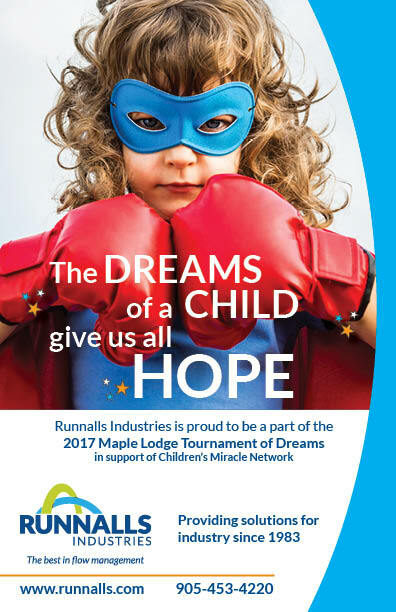 Runnalls Industries is excited to be a participating sponsor in the 17th annual Tournament of Dreams! The tournament will be hosted at Rattlesnake Golf Course in Milton on Monday, June 19th. We hope that you will join us for a great day of golf in support of a very worthy cause. “We are pleased to support this great cause and thank Maple Lodge Farms of their leadership in organizing this event,” said Debbie Reid, President of Runnalls Industries. All proceeds raised from this year’s tournament will help support your local Children’s Miracle Network® member hospitals. Each minute in Canada, 62 children are entering a Children’s Miracle Network® hospital and through your generosity we can help make miracles happen for children in our communities. We hope that everyone is equally excited about participating in the Tournament of Dreams, we look forward to seeing you on the course!